I have come to the same conclusion. No puny humans could have built these colossal structures. Here I have been trying to “unearth” the “hidden technologies” that I thought ancient human societies used. Suddenly it occurred to me that these are “other worldly” technologies – technologies of advanced beings, or technologies from another dimension. The Bent pyramid is going to be opened to the public, it seems. A rather different internal layout, but there does appear to be indications that cavitation has roughened some areas. As with other pyramids, the main sloping passage is the ram pump water inlet. The third pyramid at Gizeh is the most impressive inside, to me. What a piece of engineering, but why on earth(!) anyone would build it like that for a burial site is beyond me. I'm with lizzie on this. Alien engineers rock! Your questioning the usage of pyramids for burials, what burials? The pyramids have not had any burials in them, it has just been constantly pushed that way, ASSUMED. It is the same here in the UK and I suspect all around the globe with the megalithic sites, the archeologists find a few bodies , thus they can declare a place as a burial site. This all comes right down to what I started this thread for, to try and reveal WHY these sites were built precisely to the geometry of this universal grid. burial will be involved, as will re-birth, but not of the biological physical 3D bodies, but our true selves, we are electrical beings, in an electrical universe. Kevin said: This all comes right down to what I started this thread for, to try and reveal WHY these sites were built precisely to the geometry of this universal grid. Burial will be involved, as will re-birth, but not of the biological physical 3D bodies, but our true selves, we are electrical beings, in an electrical universe. In order to "maxamize the 'heaven/earth' energy flow", build your pyramid over the energy vortices (nodal points?) in the universal geomagnetic grid! The HeartMath Institute has shown a regulated heart rate to be crucial to the formation of a coherent electromagnetic field of the heart, and to allow intentional relaxation of the DNA helix that is associated with positive emotions. The direct correlation between the stimulated beat frequencies of the granite box and a healthy infant heartbeat suggest the chambers’ design purpose. Rather than a tomb for the dead, it appears the upper chamber and granite box were designed and used as a nativity center for stabilizing the biorhythms of the mother and child during their separation at birth. The ratio of the dimensions of the upper chamber, one-two, can also be considered a mathematical or acoustical symbolism which supports this hypothesis. 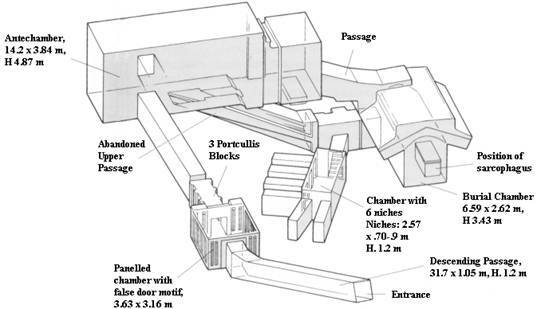 Physical evidence that the chambers were designed for this purpose was discovered during early twentieth century investigations of the ascending shafts. A balanced, full-spectrum infrasound environment has been shown to stimulate both emotional relaxation and DNA helical structural relaxation, or "denaturation". Vibrational research in Russia has demonstrated a nonlocal mode of DNA communication through an omnipresent field. The interaction has often been described as holographic and based on nonlinear coupling of DNA with electromagnetic fields, a topic to be expanded upon in this chapters conclusion. As the first months after birth are well known to be developmentally influential, perhaps exposure during and after birth to the full infrasonic range may increase DNA development and a biorhythm of balanced consciousness. The cranial volumes of the Pharoanic families were extraordinary, most notably that of Akhenaton, Nefertiti and their children. Since the unusually elongated crania have been observed in statuary depictions of even the youngest children, the assumption has been made that it was genetically related. Perhaps, in light of the new acoustical data from the Great Pyramid’s chambers this assumption may be confirmed and understood to be a result of the infrasonic stimulation, the advanced art of genetic enhancement. The elongated skulls of the ruling families of ancient high civilizations may have been developed through gestational entrainment techniques under the Great Pyramid’s magnetic umbrella. The pyramid puts things back the way they are supposed to be; it makes things more perfect. The one frequency that is common with all elements is the carrier wave. The vector angle of energy formed by the carrier wave frequency is 52.606º. This pyramid we have built is both a transmitter and receiver in one. This is why we can build a pyramid out of any material, and it will work. The elements in the material used for the pyramid start to oscillate. Wondefull links, as ever, I dub You queen Lizzie of new insights. Gives a glimpse of the consequence of the geometry, how it forms points, it doesn't show the framework that it isw all created upon, but it does provide a good visual aid to think about this. All of the norman churchs and cathedrals that I have checked, and that is countless, are constructed by utilising the available geometry that creates the adjacent point, You simply plot them out and connect the dots, there is far more fine geometry available, and the outer points are often external to the churchs, they have often left one such point marked with what are called preachers crosses normally the south of the church one is what is left standing. The churchs are nothing much different than pyramids, they are resonant chambers to focus and uplift the available aether flows, I therefore KNOW I am following in the footsteps of very brilliant dowsers, who appear to have kept, or been kept very quiet about all of this, they were of course the wandering magi, the masons. Kevin said: This all comes right down to what I started this thread for, to try and reveal WHY these sites were built precisely to the geometry of this universal grid. Burial will be involved, as will re-birth, but not of the biological physical 3D bodies, but our true selves, we are electrical beings, in an electrical universe. Gives a glimpse of the consequence of the geometry, how it forms points, it doesn't show the framework that it is all created upon, but it does provide a good visual aid to think about this. The 2012 Synchronization of the Cosmic Energy "Step-down" Transformation"? The knowledge embodied in the construction of the Wands of Horus with a filling of coal and "Bja", has its origins in the Tep Zepi era when, according to the ancient texts, "the gods dwelt on Earth and conversed with humans". "The whole world that lies below has been set in order and filled with content with the aid of things that are placed above; because the things that are below lack the power to set in order the world above. Weaker secrets should yield to stronger ones; the systems of things above is stronger than the things below"
This simple text that is, however, chiefly perceived from positions of comparative philosophy expounds in the most general form the seminal theory of "synchronization" that is the foundation of the mechanism of evolution. "The whole world that is at a low level of development is structured (organized) and develops thanks to energies (nature) of a higher order; because energies of a lower nature do not have the power to create nature of a higher order. The organization and mechanisms for the development of lower nature are subordinated to the forces of the nature of a higher order; energies of a higher order are more complex in structural organization (nature) than those of a lower order." "And as all things proceeded from the One through the agency of the One, so were all things born of this single essence through adaptation..."
Therefore the true and deliberate course of development (from the viewpoint of palaeo-science and palaeo-technology) requires synchronization with some evolution-stimulating energy belonging to a higher order of nature, the projection of which is the human being. These fundamental scientific and cosmological ideas were expounded by the priests in the Ancient Egyptian texts and "Hermetical" manuscripts. They were all received in deep antiquity from the Metu Nefer (Nether) and Shemsu Hor (Shemse-Heru) and, reflecting the philosophy of "as above, so below", were aimed at telling how to turn cosmic forces to the Earth, which is an important step in humanity's striving to learn about the divine and the immortality of the soul. "And I, said Hermes, shall make humanity rational, give it wisdom and pass on the truth. I shall never cease working for the benefit of the life of mortals, each and every one, so that the natural forces acting within them might be in harmony with the stars that are above us." "Do you not know, Asclepius, that Egypt is a reflection of the sky? Or, to be more precise, in Egypt all the actions of the forces that rule and act in the sky, have been brought down onto the earth?" The knowledge of the necessity for synchronization is of such profound significance for humanity that when received in ancient times it became the foundation of the Ancient Egyptian "Canon". Following the letter of the Canon, the idea of synchronization was perpetuated by the priests through the construction of a whole complex of pyramids on Egyptian soil in strict accordance with the pattern of the night sky. Thus the entire complex of pyramids is part of a great, but forgotten palaeo-technology, aimed at providing selected individuals with the chance to possess the secret of cosmic wisdom, connecting the Earth with the heavens by which means it is possible to overcome the "boundary of death". The creation of a geographic (geometric) copy of the night sky gives nothing from the point of view of "concordance" or harmonic resonance, if only because the sky that we see is in reality different, with depth and curvature not observable from the surface of the Earth. In actual fact the exact transfer of the night sky onto the Earth was carried out for one sole purpose - to record and perpetuate in architecture the idea of "synchronization". Therein lies one of the reasons why the predominant theme in the ancient texts is the heaven-earth dualism, interwoven with questions of resurrection and the immortality of the soul. The aim of harnessing the heavenly forces is, according to Thoth (Hermes) to make easier the "initiates'" search for immortality. Mary and Dean believe that the Ark was charged and placed into this recessed chamber. When the Ark was triggered to release its accumulated energy, it discharged upwards and formed the spiralling configuration that is now seen as the scorch marks on the wall. This youtube link is in twelve sections, but well worth listening to, imo. It could go in the schumann thread also? I do not consider We need ET to set out the pyramids or anything else, it is all set out to the lattice universal grid, and it is so simple to do, that perhaps it requires a simple person to do it, or a hobbit, which I am? These standing waves pull from the central dimensional window multiple vortical conduits. Unlike a neutral center which has a null point in the middle of a sphere, these vortical conduits have a null axis inside a tubular vortex. They pierce the earth’s surface at the aforementioned node or antinode points. Thus, there are dimensional window points spaced equally apart on the earth’s surface – these are the primary earth grid points and correspond to the vertices of the Platonic solids. Their electromagnetic configuration includes little if any magnetic, electric, or gravitational components except in special circumstances at special times. Their primary electromagnetic structure consists of potential fields, both magnetic, electric, and gravitational potential, which are not easily detectable. An acoustic wave of a combined frequency (formed upon the superposition of the opposite acoustic waves of close frequencies) from a moving source generates electromagnetic waves of the same frequency with the amplitude increasing in the longitudinal direction. The problem is solved for the first time, assuming the absence of electric charges and neglecting the frequency dispersion. It is shown that the running acoustic wave is accompanied by weak electromagnetic waves. "Matter is the coagulation of sound." Both the students of Buckminster Fuller and his protégé Dr. Hans Jenny devised clever experiments that showed how the Platonic Solids would form within a vibrating / pulsating sphere. If you have four evenly spaced nodes, you will see a tetrahedron. Six evenly spaced nodes form an octahedron. Eight evenly spaced nodes form a cube. Twenty evenly spaced nodes form the dodecahedron, and twelve evenly spaced nodes form the icosahedron. The straight lines that we see on these geometric objects simply represent the stresses that are created by the “closest distance between two points” for each of the nodes as they distribute themselves across the entire surface of the sphere. The relationship between the polyhedrons and structure of crystals and minerals is well known. Table salt is an example of how two different elements, sodium and chloride bond together to form a Platonic Solid of the Cube. Though water is not a crystal in the liquid state, the water molecule is made up of two hydrogen and one oxygen atom that form together in the shape of a tetrahedron. Another example is fluorite crystals which form the octahedron, basically all crystalline structure in creation has a molecular structure based upon the tetrahedron, cube and octahedron. All these crystalline structures are capable of conducting "electricity" to some degree or another. A piezoelectric substance is one that produces an electric charge when a mechanical stress is applied (the substance is squeezed or stretched). Conversely, a mechanical deformation (the substance shrinks or expands) is produced when an electric field is applied. This effect is formed in crystals that have no center of symmetry. The piezoelectric crystal bends in different ways at different frequencies. This bending is called the vibration mode. The crystal can be made into various shapes to achieve different vibration modes. To realize small, cost effective and high performance products, several modes have been developed to operate over several frequency ranges. These modes allow us to make products working in the low kHz range up to the MHz range. Crystalline substances, when subjected to mechanical stress, produce an electric current. This phenomenon is known as the piezoelectric effect. Closely related is biorheology, the study of the deformation and flow of matter in living systems. The potential clinical implications of biorheology and the piezoelectric effect challenge the imagination. That wandsofhorus link might just be the best you have ever posted. For once, the guy knows what he is taling about. There is more knowledge in the passage you posted than in any and everything Sitchin and his ilk have written. I shall be reading the site properly once I get the time. Hi lizzie, accoustics, resonance and electricity all seem to be part of the pyramid machine to me, but I think the idea that anyone was supposed to be inside them while they were operating should be discounted. The strength of the pressure waves would liquify your innards, I believe! There are some smaller central american pyramids that seem to have similar wierd constructs inside, but on a scale much too small to fit a person through, and that have had to be opened up by treasure hunters to gain access. No treasures have ever been found, to my knowledge. I would be accepting of the idea that the energies being tapped or generated by the pyramids were used for some as yet hidden functions, perhaps the 'wands' were resonant to the pyramids? Interesting line of thinking but what if the pyramids, and other such structures, were not for focusing energies inwards but for blocking energies? In other words, what if they were sensory deprivation chambers which allowed the user to access his/her mind without any of the usual input/output clutter from the brain and senses? Just a thought. Thoth was also regarded as a deity who understood the mysteries of all that is hidden under the heavenly vault, and who had the ability to bestow wisdom on selected individuals. It was said that he had inscribed his knowledge in secret books and hidden these about the earth, intending that they should be sought for by future generations but found only by the worthy - who were to use their discoveries for the benefit of mankind. The Egyptians and the Sumerian people of Mesopotamia worshipped virtually identical lunar deities, who were among the very oldest in their respective pantheons. Exactly like Thoth, the Sumerian moon-god Sin was charged with measuring the passage of time. The similarity between the two gods is too close to be accidental. It would be wrong to say that the Egyptians borrowed from the Sumerians or the Sumerians from the Egyptians, but it may be submitted that the literati of both peoples borrowed their theological systems from some common, but exceedingly ancient source. The earliest Egyptian calendar was based on the moon's cycles, but later the Egyptians realized that the "Dog Star" in Canis Major, which we call Sirius, rose next to the sun every 365 days, about when the annual inundation of the Nile began. Based on this knowledge, they devised a 365-day calendar that seems to have begun in 4236 B.C., the earliest recorded year in history. The calendar system of ancient Egypt is unique to both the cosmology of the Egyptians and their religion: Sirius is the brightest star in the sky, the star which became the marker of an important ancient Egyptian calendar, the star which according to some is at the centre of beliefs held by the Freemasons, is the star from where the forefathers of the human race may have come from. The beginning of the year, also called "the opening of the year", was marked by the emergence of the star Sirius, in the constellation of Canis Major. The constellation emerged roughly on June 21st., and was called "the going up of the goddess Sothis". The star was visible just before sunrise, and is still one of the brightest stars in the sky, located to the lower left of Orion and taking the form of the dog's nose in the constellation Canis Major. As can be seen from this historical material, our calendar has come to us from ancient Egypt. It is a calendar of Sirius, of the star Sothis and we continue to use it. Our civilization could not independently solve the problem of creating an exact calendar, having offered only uncountable "improvements". As a result, the Julian and the Gregorian calendars have lost the exact system incorporated in the ancient calendar of Thoth. Unfortunately, this knowledge was lost and was not accessible to us. Our calendar reforms resulted in the loss of information once incorporated in the calendar of Thoth. I speak about that information, the existence of which we did not suspect. I speak about the Message. The ancient civilization of Egypt guarded this Message for thousands of years, and even after the end of its existence, transmitted it to us by way of the Calendar and the secret knowledge incorporated in it, thus ensuring that we keep this knowledge for future generations, yet unborn, for those who can understand its deep internal contents. I do not know if it was made consciously or not, but it was made. Who could use higher mathematics on the Earth 6000 years ago? Who could leave us such a Message in the language of higher mathematics? Who was Thoth? What kind of technology, and what state of science and culture, would have been required to do a job like this? I get the feeling that everything was planned, intended, carefully worked out, that they were fulfilling a long-term objective. Mesopotamian myths speak of amphibious beings, which have given knowledge to the people. The leader of these beings was named Oannes. Under a fish's head he had another head. In the Calendar-Message there is an image of Oannes. Last edited by lizzie on Fri Apr 24, 2009 5:59 pm, edited 1 time in total. The Duat sky region is the place through which the Pharaohs believed that their souls would travel after death. It was the starting point of the Pharaoh's journey back to the stars from whence he came. The Duat separates the land of the living from the land of the dead. The very similar "starry" myths were kept and on the American continent. The five-pointed star within a circle was the Egyptian symbol of the Duat. This image you can see on the top of this page. "In fact the Duat had very specific celestial coordinates. ...the Duat had been conceived of by the ancient Egyptians as having been "localized in the eastern part of the sky" ...the oldest texts... tell us: "Orion has been enveloped by the Duat while he who lives on the Horizon purifies himself. It is a well known scale. The ancient civilization had constructed at Giza an exact replica of the Duat sky region. The Duat stars have provided the model for the complex of Giza pyramids, of this mysterious ancient temple. The Giza Pyramids serve one ultimate purpose, to indicate the Gateway to the Underworld (Duat) by pure geometry. In my opinion, the builders were part of a Global Earth Civilization that broke up about 6,500 years ago, and the massive Giza Pyramids are their relics that survived from the end of their civilization. They have warned us. Four pyramids are built as model of four stars of the Duat sky region. Three small pyramids near the Pyramid of Cheops, and three small pyramids near the Pyramid of Menkaure determine lines of the horizontal coordinate system (altitude and azimuth). Last edited by lizzie on Fri Apr 24, 2009 6:24 pm, edited 4 times in total. Such a thing could not have been a coincidence. Did Sumerians see the Mayan gods or did Maya see the Sumerian gods? These were two civilizations that were far apart (one in the Central America and the other in the Middle East, in an area that is now Iraq). How were these ancient civilizations connected? The first answer - an extra-terrestrial origin.